Alright, We need a winner for last week's assignment!! I am so excited for this week!! This weeks assignment is to finish your quilt top!! I just love seeing it all come together!! So basically, finishing a quilt consists of 3 steps. Basting, Quilting, and Binding. Which sounds so simple but is actually a rather large part of making the quilt. If you are new to quilting, I thought you might find these three video's helpful. They go over the basics of these three steps and the options available to you and will be this weeks "tutorials ". So once it's finished up then what??? Let's review!!! 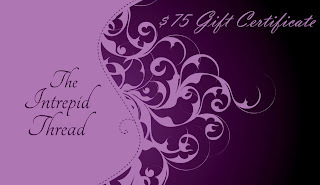 The Grand Prizes that you are hoping to be picked for is a . .
Now, as just mentioned, you only have to have your quilt top done to enter into the grand prize link up . . . but I wanted to encourage you to finish these quilts and not set the quilt top in a pile of "to be quilted" so . . . 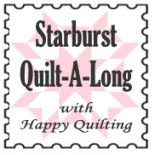 I am planning a little Parade for the 4th of March :) The parade will be for quilted and bound Starburst Quilts!! So, if you would like your quilt to be in the Parade, please send me an email (happyquiltingmelissa@gmail.com) with your favorite Starburst Quilt picture attached as well as the name you would like your photo listed with, where you are from, and a blog or flickr photostream link if applicable. You can email me anytime from now until the morning of the 4th and I will get you added to the Parade!!! I am so looking forward to seeing everyone's finishes!!! You can decide if you would like to add your finish picture to the Flickr group now or wait until after the parade to keep it a secret :) Grand Prize winners will be announced on March 4th followed by an amazing parade filled with all of your beautiful quilts!!! Can't wait!!! So now what do you do??? Then email me your finish by March 4!!!! Wow delighted to be winner of a charm pack - thanks. I'm now on to the binding, 2 sides almost sewn down, a few more evenings on the sofa and it will be done! I should have mine back from the longarmer on Thurs - binding is made a waiting!! Melissa, What a great job you have done with your video on quilting. 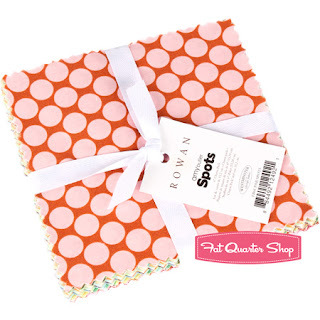 Thanks for providing good information to us less experienced quilters. I almost have the top done. It is soo big. I just have the outer boarders at this point to do. I bought a can of spray basting to (hopefully) help things along! Melissa, what did you mean from a few posts ago, to save your scraps from your fat quarters for a scrappy binding? Will you tell us how you like to make scrappy bindings? and what ideas do you have to quilt these large beautiful areas of our Starbursts?